EZ Cat 2 is a disk cataloguer. 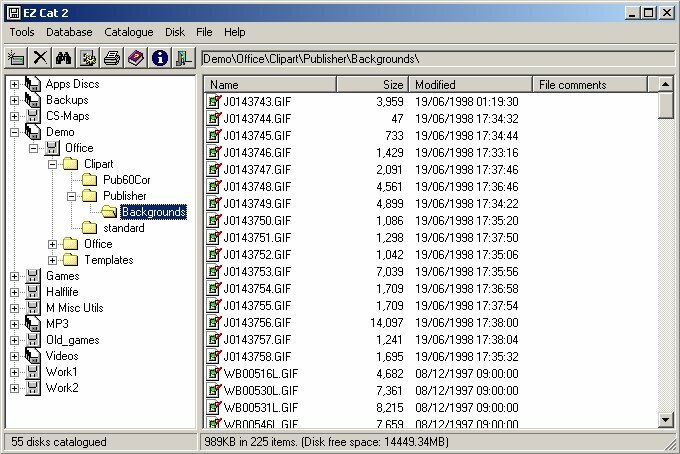 You can catalogue the contents of all your CDRs, DVDs, Zip disks, floppies, hard drives, network drives, etc etc, and then browse and search through the contents of all the disks without having to insert any of them. It is possible to search the database on file names, directory names, disk names or file comments. Contents of disks can be printed, as can search results. Disks can be organised into seperate catalogues. File extension filters can be applied to stop some files being included in the catalogue. It is possible to run files straight out of EZ Cat by double clicking on them as you would do in Windows Explorer, after inserting the disk if necessary. If you are installing a new copy, extract the zip file, run the program. Easy. If you are upgrading from 2.6/2.61, then the following applies. There is no installer any more, so you will need to manually extract the zip file containing EZ Cat 2 into the EZ Cat 2 program folder. This is usually C:\Program Files\EZ Cat 2\. The way that EZ Cat stores its file comments is now slightly different in 2.7 and so your old comments will not show up in the new version. The converter listed below will convert your old filecomments.dat to the new format. Most of all, I would strongly recommend that you make a backup copy of all your current data files just in case something goes wrong with the file comments converter or version 2.70/2.71/2.72/2.73 is buggy and does something nasty with your data. Good luck with the converter, all I can say is that it worked on my test data set - it should work for you too. Oh and one final thing, run the converter before you start shifting disks into catalogues! If you don't it won't find the files associated with the comments and it won't work. Email me if you have problems with it. EZ Cat currently requires that you already have installed on your computer the Visual Basic version 6 runtime support files. These files are common to many programs and are therefore usually already installed, but if EZ Cat complains about missing files when you run it you can download and install the support files. EZ Cat can still run on Windows 10 (and therefore probably Windows 8 and 7) but two OCX files must be installed. Here is a zip file containing the required files and a batch file to do the work for you. This was created for Windows 10 64-bit - depending on file paths on other Windows versions it may or may not work. If it works for you let me know and I'll update this info. Download and extract the zip file and then right-click the install file and choose "Run As Administrator". You should get two registered OK messages. Version change history is available here. The old shareware arrangements for EZ Cat are now obselete. As from EZ Cat 2.7 the software is now free for use commercially and non-commercially. There is no warranty for the software of any kind. You use it at your own risk. Codes for older versions will no longer be sent out.